Lee Child learned style from Hemingway. Or maybe from Elmore Leonard or Dashiell Hammett. He writes short, clean, sometimes incomplete but straight-to-the-point sentences. Brief paragraphs, plus almost as short episodic sections consisting of alternating points of view. Except when he writes long action sequences with lots of ands and Reacher did this and that and then his opponents fall down like flies after being sprayed with insecticide. Reacher gets knocked down, too, and instantly he’s back on his feet again. To stay down long means to die. Although the writing is often sparse and minimalist, it’s also detail-rich. Child pays close attention to tiny details, and so does protagonist Jack Reacher. Past Tense (Delacorte Press/Random House, November 15, 2018) is Child’s 22nd Reacher thriller. Patty Sundstrom and Shorty Fleck are a Canadian potato farmer and a timber sawmill worker on their way to NYC to sell something valuable enough to raise sufficient capital to start a new life in Florida. When their old car breaks down in the woods near Laconia, NH, not far from where Reacher’s father Stan was born and raised, they plan to spend only one night. Little do they know they might be trapped there for the rest of their lives. Jack Reacher, walking and thumbing his way across America, sees a sign for Laconia and decides to visit the town where his father allegedly grew up. Of course, nothing is ever simple in a Jack Reacher novel. Hope for the best, plan for the worst. It’s been said that Reacher walks where angels fear to tread. Whenever he encounters a wrong, he feels duty-bound by his own internal code of honor to set it right. Whenever he finds a bully picking on an underdog, he has to step in. He’s a giant of a man, both literally and figuratively. And when he gets mad, all hell can break loose. Those are traits he inherited from his father. Faithful readers will find many of the elements they expect in a great Reacher novel in the 400 pages of Past Tense: an intriguing mystery to solve (several, actually); plenty of broken noses and broken bones; bodies piled up like cordwood (some dead, others merely knocked unconscious); a beautiful female cop who proves not only extremely competent but an excellent foil for Reacher to toy with; plenty of bad guys and a few good guys Reacher needs to protect; a realistic threat to life and limb; and a get-out-of-town deadline. What makes Past Tense different, however, is the number of previously-unknown Reachers that may or may not be closely related to Jack. Like all the other Lee Child novels, I couldn’t put this book down. The dramatic tension and anticipation of violence kept me devouring words. Learning more about the Reacher family was icing on the cake. Highly recommended. Lee and me at Thrillerfest. I’m the guy wearing glasses. I signed books at WisCon’s SignOut in the second floor ballroom of the Concourse Hotel in Madison, WI on Memorial Day, May 29, 2017, from Noon until 1:30 PM. I do so every year, although few people at WisCon ask for my autograph (I do, always, have at least one; and one is all I need). I attend WisCon as a learning experience. Not only do I learn about authors and books I would not hear about otherwise, rubbing shoulders with diverse writers and readers takes me out of my normally complacent comfort zone, therefore allowing me to grow both as a person and as a writer and reader of science fiction and fantasy. Each year I come away from WisCon filled with fury. I — a privileged white straight male – am seen there as the hated enemy, the quintessential dirty old man, the has-been, the exploiter of the marginalized and vulnerable downtrodden. I am, at WisCon, The Invisible Man, not H. G. Wells’ fictional character but James Ellison’s. And that makes me angry. WisCon is filled with angry people of all ages, races, gender identities, political persuasions, and disabilities. People like me have always been in the minority at a gender-bending feminist celebration. It doesn’t matter if I support feminist ideals or love the works of Russ, Tiptree, Nisi Shawl, and Nora Jemisin. I am, nevertheless, an outsider at WisCon. Outsiders, in my biased opinion, make the best writers. We’re able to observe, not necessarily more objectively but more intensely, events and relationships. One of the cherished events I always look forward to at WisCon is the gathering of mid-career sf and fantasy authors who meet to share survival secrets. We have all been published by major NY houses sometime in the past, but we’ve been affected by changes in the book industry and changes in our own lives that have adversely affected our careers. At one time, we may have been the darlings of the book trade, winners of awards and inspirations for wannabe writers who have since replaced us on bestseller lists. We may or may not still look like our photos on book jackets or that decades ago appeared in Locus. Living up to our reputations has made writing more difficult for many of us. We often become our own worst critics. It’s nice to know I’m not alone in my self-doubt. Maybe I’m not as much of an outsider as I think I am. WisCon teaches me that we all fear being left out or left behind or simply ignored. We all want to matter, to be important, to make a difference. That’s a good lesson for a privileged white straight male to remember. Why so many serial killers? The idea behind Begley’s book was so compelling that I simply had to buy it. I’m a compulsive bookaholic who needs to know what’s inside every book (which may be an impossible task) or continuous wondering will drive me crazy. That’s my excuse, anyway, for buying books, and I’m sticking to it. I’ve become a compulsive book hoarder. Books are more than a compulsion with me, they’re an obsession. And, as long as I have a book to read or a book to write, I don’t feel the need to kill anyone. Is compulsion an anxiety disorder? Is it a personality disorder? An addiction? A syndrome? What’s the difference between Impulsive and Compulsive drives? Everyone feels anxious. Everyone is occasionally impulsive or compulsive. Should impulsive and compulsive behaviors be considered pathological only when they become so excessive they interfere with normal life functions? Can we control our impulsive and compulsive behaviors? When do we know we need to? Serial killers are addicts who get pleasure from risk-taking. They thrive on anxiety rather than feel a need to alleviate anxiety. They’re addicted to the pleasure they get from causing pain. They know their actions are wrong, but they can’t stop until they get caught. Seeing how long they can get away with doing something dangerous and forbidden is half the fun. They’re more concerned with what happens when they do something than when they don’t do something. They’re thrill addicts who need regular fixes or suffer the pains of withdrawal. Serial killing is addictive behavior, It isn’t compulsive. Compulsive behavior, on the other hand, results from worries about what will happen if one does not possess something (knowledge, an object, followers on Facebook, love, money, drugs, bullets, soldiers, words in print, etc.) in sufficient quantity or quality to prevent disaster. It is the opposite of risk-taking. In one’s mind, possession is seen as the only thing that can prevent a future catastrophe from occurring. Addictions can become compulsions only when worry about what may happen if you can’t continue the addictive (pleasurable) behavior takes over. You no longer get pleasure from risk-taking, but must take different risks to avoid pain caused by discontinuing the risky behavior. Like feeling compelled to kill in order to cover your tracks and not for pleasure. Like stockpiling books you’ll never have a chance to read. When anxiety becomes fear, compulsions can become obsessive. You’re terrorized that unless you get things just right, absolutely perfect, calamity will happen. You, and only you can prevent bad things from happening, especially to ones you love. Only scrupulous adherence to a magical ritual (like buying certain books or writing them a certain way) will prevent disaster. As a writer of crime-suspense thrillers, I enjoyed this book ‘s insights immensely. It was written in language a layman could understand, covered the gamut of compulsive behaviors, and tried to tie things together in a nice package. More importantly, though, this book taught me that when compulsions serve a useful function and contribute to a successful life rather than destroying it, being compulsive isn’t always bad. Maybe that means I’m not as crazy as I thought. The convention season is about to begin again, and I’m gearing up to make personal appearances at four or five cons. I’m not as young as I once was (who is? ), so this year I’m limiting my appearances and staying home to write more. I’ve said numerous times that the writing business is a numbers game (See “The Numbers Game” on my website or in the dozens of other place it’s been published). One becomes a good writer only by writing, and the more you write, the more you’ll get published. Depending on your innate talent and the number of books you’ve read, it takes writing five to ten complete novels before you become good enough to see print. Each novel I write is better than the novel I wrote before. If you doubt that, compare Claw Hammer with Meat Cleaver or The Girl Who Lived. It also takes a minimum of five years with five good novels in print before you breakout into public consciousness. Selling books requires word-of-mouth recommendations, good reviews, and titles displayed on bookstore shelves and on library shelves. Few people buy books authored by unknowns. Does appearing at conventions help? Very little. Attendance at conventions and book signings is a chance to meet and greet the reading public, but it doesn’t sell a lot of books. Not unless people already know your name and recognize you as a good author. I made a mistake and seriously damaged my authorial career when I stopped writing fiction for twenty years. Sure, there are still some people at conventions who know me and know my work from the 1980s and 1990s. But they are few and far between. I have been back in the land of the living for nearly four years now. That is, I have regularly attended writing conferernces, genre conventions, and book signings since the year after my wife, Gretta M. Anderson, died of a massive heart attack in 2012. I appeared on panels, presented workshops, and autographed my own books. I attended the Nebula Awards, the Bram Stoker Awards, the Hugo Awards, and the Tiptree Awards banquets. I appeared on programs at MidAmericon II, Thrillerfest, World Fantasy Convention, Stokercon, OdysseyCon, Wiscon, and Windycon. I renewed friendships with authors, editors, and agents I have known for years and became new friends with authors, editors, and agents I met at recent cons. I have two new stories already published in anthologies since last year, and I’ll have a major novel released on March 2. Four more stories will appear in anthologies by the end of 2017, and so will two more novels. So I must make some efforts to promote those works in the marketplace. I owe it to my editors and publishers, and to fans who expect an autograph when they buy my books. I’ll be at Murder and Mayhem in Chicago March 11, Stokercon 2017 in Long Beach, CA April 27-30, Wiscon in Madison, WI May 26-29, and Thrillerfest in NYC July 13-16. This year or the next should be my breakout year. The Girl Who Lived has received excellent reviews, and might be a breakout book. I plan to promote the hell out of it. So, if you want to read what I believe is my best book yet, buy a copy of The Girl Who Lived. And ask for my autograph when I seen you at one of those conventions I mentioned. My father, Paul Anders Anderson, died 48 years ago today. He was born in 1904, and he was 64 years old when he died. He was three months shy of mandatory retirement. He had no plans of what to do with his life once he stopped working. Dad had worked swing shift in a fastener factory — days one week and nights the next — for more than forty years,. During WWII and the boom decade that followed, he worked ten hours a day, six days a week. I was raised more by my paternal grandparents who resided in the same house with us than I was by my birth parents. It seemed like Dad was always working and mom was always doing something at church. It wasn’t until after my grandparents died when I was twelve that I got to really know my mother and father. What I cherish most about my parents is they read books and magazines and newspapers, and they encouraged me to read by reading to me when I was little and buying books for me to read to them as I grew. My father dropped out of school in the fourth grade. Although he was born and raised in Illinois and Wisconsin, English was not his native language. His parents, my grandparents, read and spoke only Swedish. Swedish was what was taught in the Rockford school Dad attended (Dad dropped out of school when English became mandatory). Dad learned English by reading books and newspapers on his own. My mother, on the other hand, was of English and Irish extraction and graduated from both Rockford Central High School and Rockford Business College. She typed more than 120 WPM and knew Gregg shorthand. She was literate and, besides reading many of the classics, read Hemingway and Fitzgerald and popular writers like Maugham, O’Hara, Edna Ferber, Taylor Caldwell, and Graham Greene. Mom and Grandma Anderson took turns reading me to sleep every night until I was four. Grandma read fairy tales in Swedish and Mom read Beatrix Potter in English. I learned to read by following their fingers touching each of the words, silently pronouncing those words to myself after hearing the words spoken. My father bought me comic books every week when he went to the newsstand to purchase the Sunday Chicago newspapers. We had home delivery of the local daily newspapers, but Dad bought the Chicago Sunday’s early editions—Daily News, Sun-Times, Tribune, Harold-American—plus the Milwaukee Sentinel at the corner newsstand on Saturday afternoon on his way home from work. Dad would read me the Sunday funnies and then read the newspapers himself while I read my comic books. When I came across a word I didn’t understand or couldn’t pronounce, I’d ask Dad. He’d get out the big Webster’s Unabridged and we’d look up the words together. My father and I learned to read in English at the same time. My mom taught me to write and how to type. And, every other Wednesday, Mom and Dad would take me to the local public library branch and we’d find books we could bring home to read. It wasn’t until after my grandparents and then my mother died, that my father and I talked. We spent time reading together but we seldom talked to each other. The summer after my mother died, Dad asked me to accompany him on a journey across America—just the two of us in Dad’s 1959 Pontiac—on a 3-week road trip to the west coast. Along the way, we visited Glacier National Park, Yellowstone, Mount Rushmore, Seattle, and everything in between. I was nineteen, and Dad and I could talk man-to-man for the first time ever. Dad came to visit me at Fort Knox when I graduated from Basic Army Combat Training. Three years later, two months after my daughter Tammy was born, My father died of a heart attack while shoveling the sidewalk on December 28, 1968. That was 48 years ago now. I don’t know if I will be alive on the fiftieth anniversary of Dad’s death. I thought I should share these memories while I still can. This year has been, for me, one of both discovery and discoverability. Columbus had his 1492. I had 2016, and the year isn’t even over yet! Interesting that I should write this the morning after returning from Columbus, Ohio, where I read, autographed and participated in a R. A. Lafferty panel at World Fantasy Convention 2016. The trip odometer on my ten-year-old Toyota turned over another thousand miles as I arrived back home in Rockford, Illinois. During the past five years since Gretta’s tragic untimely death, I have traveled more than a hundred thousand miles promoting myself, my new writing, meeting new people, and renewing old friendships. Is it any wonder I feel a little like Brian Keene on his current farewell tour or Richard Collier in Richard Matheson’s Bid Time Return? Life has often been likened to a journey, and I suppose there is a passing resemblance. We, in the fiction business, send our heroes on impossible quests that involve actual or metaphorical journeys of discovery. Writers, like readers and protagonists, must journey from here to there in order to discover who and what they really are. Here are some the important things I discovered about myself this year: I kill people for a living, I can never remember a pitch or an elevator speech when an agent or editor asks me what I’m excited about now, and I have lots of wonderful friends and acquaintances who actually do remember me despite all of my faults and foibles (or perhaps because of them). Every writer needs a label (as, according to publishers and librarians, does every published book), and mine is “I kill people for a living.” I forgot to mention that I kill people for a living when Darrell Schweitzer asked me to introduce myself to the large audience at the Ray Lafferty panel during WFC. I mumbled something about being first and foremost a reader (as was Lafferty), a shy guy who doesn’t know how to promote himself at an SFF convention. I should have, instead, captured the audience’s attention by mentioning that I kill people for a living. I didn’t, and I regret it. We live and learn. Don’t we? Likewise, when an editor asked me in an elevator what I was working on now, I should not have mumbled “I never talk about works in progress because talking depletes the energy I reserve for my writing.” What a missed opportunity! I should have had a pitch prepared so the editor, before leaving the elevator, would have asked to see the completed manuscript. Does it do any good to kick myself after the fact? But I was heartened by good friends who remembered my name and my characters from my stories which were published alongside theirs in anthologies or magazines or from panels we had been on together at Worldcons or Windycons or previous World Fantasy Cons. I got to spend some quality time discussing the business of writing with well-known authors I respect. What more can one ask for? And a few friends even showed up to hear me read from Winds and Light, two of my supernatural fantasies in the Winds-Cycle. Just as valuable an experience, however, was the road from here to there and back again. I wrote in my mind an entire short story due next January for an anthology, worked out the next two chapters in my current WIP, and saw locations and scenery I want to describe in future novels. I drove the same I-70 Jack Maguire and Amanda Miller drove in my novel Executive Function to get from St. Louis to Washington, DC. Now I am back at my keyboard and putting those experiences into words. During the past five years since Gretta died, I have seen much of the country I never had the chance to see before. Oh, sure, I traveled a lot when I was a soldier. Even then I was a writer at heart and noted people and places for future fictionalizing. But looking at everything through the eyes of a working writer is different. You are on the hero’s journey of discovery. Noting how tired and exhausted—yet exhilarated—I looked and we both felt, Stephen Vessels asked me in the smoking room at WFC as I prepared to depart for home: “So, was it worth it?” Stephen and I attended Thrillerfest in NYC, MidAmericon2 in Kansas City, and World Fantasy Convention in Columbus this year on book promotion tours and kept bumping into each other. We took time out of our busy writing schedules to promote ourselves and our books, spent our own hard-earned money, and traveled thousands of miles. Was it worth it? Was it necessary? Did it sell books? The answer, of course, is still blowing in the wind. Was it worth it to meet fellow authors and readers in person? Yes. With so many titles being published these days, promotion is essential to discoverability. The more people who know your name and can place a face with the name, the more books you are likely to sell. That’s the theory anyway. But the reality is that the more books you write, the better you write, and the more people will want to read what you write. There is a direct relationship between quantity and quality, although it’s almost as easy to write lots of bad books as it is to write just one. What matters most, though, is what you’ve learned about the human condition that readers recognize as true in their own lives. If you are able to share your discoveries with others in a way that resonates with them, they will want to read more of what you write. It is really as simple as that. In the final analysis, it’s the writing that matters. So next year I will stay home and write more. 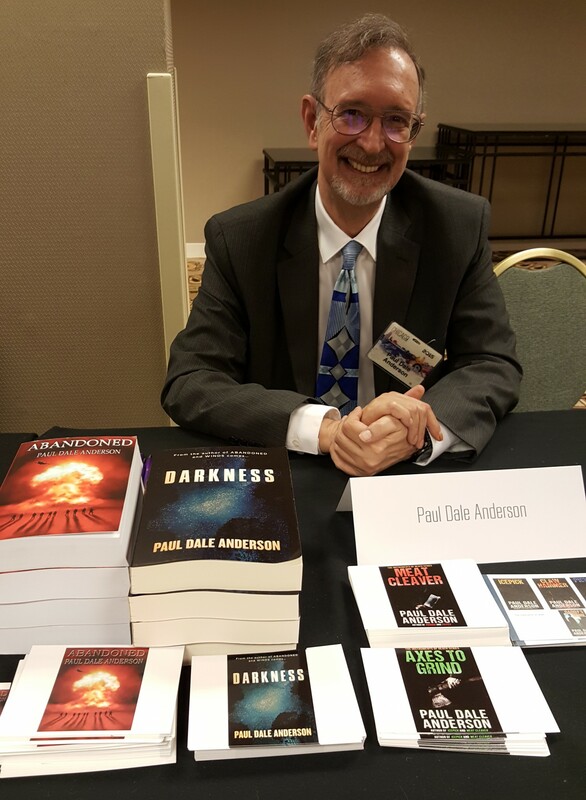 I was gratified when a Nebula and Hugo nominated writer I admire told people at his reading at Worldcon that Paul Dale Anderson is a fantastic writer and everyone should read Paul Dale Anderson’s books. I was thrilled when so many people showed up at my own readings at Stokercon and WFC. I was honored when readers asked me to sign copies of my novels for them. But now it’s time to write. I have deadlines looming. I am happy to be home with my cats and my books and my computers where new works beg to be written. I discovered a lot during my many travels and in my life’s journey from here to there and back again. I invite you to discover me through my writings. This weekend was like returning home for me. I attended Arcana in St. Paul, Minnesota. Arcana Con, for those in the know, is the Midwest equivalent of NECon. Currently located at the Bandana Square Best Western Plus in St. Paul, MN, Arcana 46 was held October 21-23, 2016. It’s a fantasy convention that appeals to collectors and lovers of dark fantasy and horror. Bandana Square once housed the Northern Pacific Railroad’s Steam Locomotive repair shops. The hotel abuts where the locomotives were painted. The building has rails embedded in the floor and the doors look big enough to admit a steam locomotive. Freight trains still pass by within a half-block of the hotel. Minneapolis/St. Paul was once home to some of the biggest names in pulp fiction. William Fawcett started Fawcett Publications there with Capt. Billy’s Whiz-bang. August Derleth and Donald Wandrei started Arkham House within a stone’s throw of the Twin Cities. Science Fiction greats like Poul Anderson and Gordon R. Dickson came from Minneapolis. Weird Tales cover artist Jon Arfstrom made his life-long home in St. Paul. Fedogan and Bremer was founded in Minneapolis. Literary agent extraordinaire Kirby McCauley got his start in Minneapolis after graduating from the University of Minnesota. John Sandford still lives and works there. Jon Arfstrom’s painting on the cover of The Strange Company’s edition of The Devil Made Me Do It, 1985. Jon Arfstrom’s portrait of me, 1986. I began attending gatherings of Lovecraftians in Minneapolis and St. Paul in 1982 after meeting Jack Koblas and Eric Carlson at a World Fantasy Convention. Jack and Eric were editors of Etchings and Odysseys, a professionally printed small press fanzine devoted to Weird Tales-style pulp fiction. I, of course, had read most of HPL and Henry Kuttner by that time, and after Jack, Eric, and I carried on long knowledgeable conversations during the WFC, we became life-long friends (both Jack and Eric passed away much too soon, and I miss them a lot). Jack and Eric invited me to submit an article for the special Henry Kuttner tribute issue of E&O, and they also invited me to attend MinnCon (the forerunner of ArcanaCon) the following October. I agreed to write the Kuttner article and to appear on panels at MinnCon. I also received an invitation from The Strange Company publisher R. Alain (Randy) Everts to attend MadCon in Madison, Wisconsin the following May when E&O #4 would be released with my Kuttner article in it. Randy invited me to submit original fiction to The Arkham Sampler, and he bought several of my stories (he actually paid me cash money and bought me meals at expensive restaurants). He (The Strange Company) also published The Devil Made Me do It, a collection of 20 of my early stories, and a chapbook of Love Till the End of Time. I also sold him a couple of my early down-and-dirty novels that other packagers didn’t want. Randy supposedly published them under pseudonyms. I cranked out two 65,000 word novels on a manual typewriter every month for four years, and some of them were pretty bad (downright, god-awful bad) but they helped me learn my craft. Then I married Gretta, took a regular 9 to 5 job with a medical publisher and later with Mutual Fund Sourcebook publisher Morningstar, and my fiction output dwindled. Gretta and I attended MadCons and MinnCons every year from 1983 until 1990. I appeared on Lovecraft and Horror panels, and Gretta appeared with other small press editors on editing and publishing panels at several of the first ArcanaCons after MadCons and MinnCons ceased and Arcana became a full-fledged annual convention instead of just a gathering of friends and Lovecraft scholars. We stopped attending sf and fantasy conventions entirely in favor of attending professional psychology educational conferences (APA, APS, Illinois Counseling Society, NGH, and alternative healing and wellness conferences). This year I returned to Bandana Square for ArcanaCon 46. Most of the people I knew from MinnCon and earlier AracanaCons have passed away or moved out of state. Koblas and Carlson died. Jon Arfstrom died just last year. Bob Weinberg died just last month. Randy Everts is reputed to be living in Hawaii. R. Dixon Smith is now in California. David Pudelwitz was last seen in New Mexico. Roger Gerberding no longer lives in the twin cities, but he is still alive and still painting. Audrey Parente is busy with PulpAdventureCon in New Jersey and Florida. Roger Dale Trexler was unable to make this con but promises to make next year’s ArcanaCon when the GOH will be William F. Nolan. I did spend quality time in conversation with Scott Wyatt, Eric Heideman, Dwayne Olson, and Greg Ketter of DreamHaven Books. I also got to meet the delightful Kathe Koja, this year’s ArcanaCon GOH. What I like about ArcanaCon is the attendees are all readers and book collectors. The con is small and intimate enough to get to know everyone and talk with everyone. Once upon a time, attendance at MinnCon was by invitation only. When it became ArcanaCon, it was opened to the public but never widely advertised. It’s one of the best-kept secrets in fandom. To me, it’s like home. Yes, Virginia. You really can go home again.